Admit it, there’s something inside of each one of us that longs to be Peter Parker or Wonder Woman, right? I mean, really, don’t honestly tell me that never in your lifetime have you dreamt about shooting spider webs out of your wrists or using bulletproof bracelets and a magic golden lasso to beat the bad guys (or girls)! It’s probably safe to say that most of us don’t have superhuman powers to fight for a good cause. But don’t let that get you down – it turns out that there are some equally powerful and impactful things you and your organization can do to give back to make the world a better place and give back to others and your community! And so, for our last post within our November blog series on ‘giving’, we will focus on the particularly innovative, inspiring, and unique ways that organizations can embrace the concept of ‘giving’- so that everyone is able to feel like a super hero! We’ve already shared how we use our Charity Team to champion our company’s charitable initiatives, as well as several tips and strategies for how to sustain a successful Charity Program. 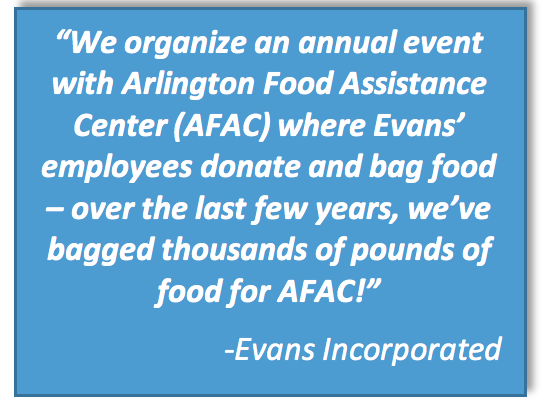 That may have left you wondering, what do other organizations that have award-winning corporate social responsibility (CSR) teams and best-in-class charity and community outreach programs do to give back? And, what are the most creative and innovative things that organizations can do to promote service and giving? Let’s find out! How do organizations embrace the concept of service and giving in creative and inventive ways? 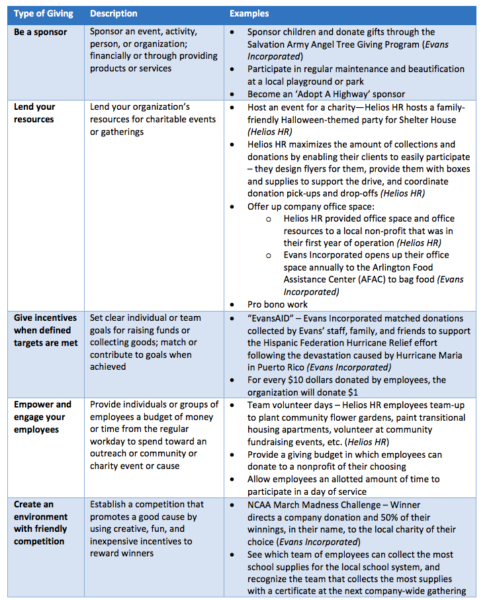 There are a number of creative and innovative things that organizations can do to promote charitable events and activities. 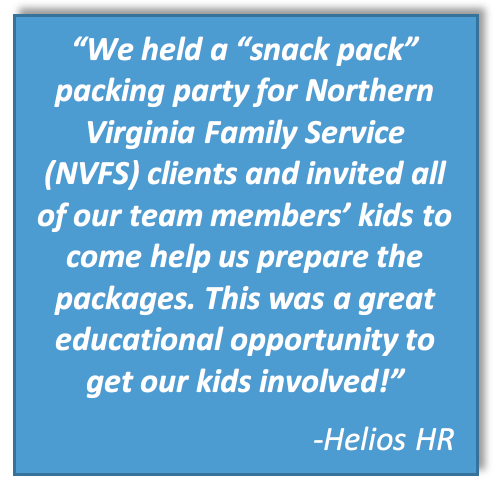 To recognize the most exciting, interesting, and impactful types of giving, we have drawn from 1) our own experiences and practices here at FMP, 2) existing trends and best practices, and 3) the incredible work being done at two fellow award-winning organizations for commitments to community outreach, 2018 Northern Virginia Family Service (NVFS) CARE Award recipients Evans Incorporated and Helios HR. As you look through this list, we encourage you to think about how you may apply one or two of these ideas at your organization (if you are not already!). How can you encourage and promote participation and maximize employee involvement? I hope this has sparked some ideas and that you’re already thinking about exciting, creative, and interesting ways that your organization can embrace the concept of ‘giving’ this holiday season! Don’t let the stress of the end-of-year activities be your organization’s kryptonite to giving back to those in need – with a little thought, creativity, and commitment every organization and employee can be a super hero!